"The girl stood there, a large pair of sharp pruning shears in her right hand, waiting for the turtle to stick its head out." 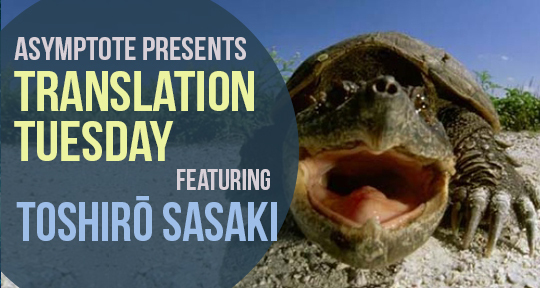 In this story by Toshirō Sasaki, a young woman in pre-war Japan buys a turtle and unintentionally contributes to a man’s arrest, opening up questions about class, poverty, and criminality in a nation that is beginning to rapidly modernise. At the black markets in Ginza a girl bought a soft-shell turtle. She put it inside her large crocodile-leather opera bag and set out on the Ginza streets. It was early evening, and the district was filled with people bustling about. She pushed her way through the crowd, heading for the Owari-chō tram stop. Customers gathered impatiently at the opening street stalls. Red, blue, and violet rays of light swayed all around. The chaotic sounds of footsteps echoed. Feeling that someone must have been calling out to her, the girl came to a stop. From her shoulder to the end of the street, countless shoulders rubbed together. Grey summer overcoats and bright green silk crepes. Spring jackets the color of matcha. Brand new straw hats. A rich fragrance of sweets. And then the refreshing chill of the night air, washing away the mood of afternoon. It was an illusion. No one had been calling to her at all. Only a pale man with a long face, a grey hunting cap pulled down over his eyes and light brown jacket wrapped around his body, his shoulder touching hers, moved towards her.